There’s a long, rich tradition of soundtracks eclipsing mediocre-to-terrible films. 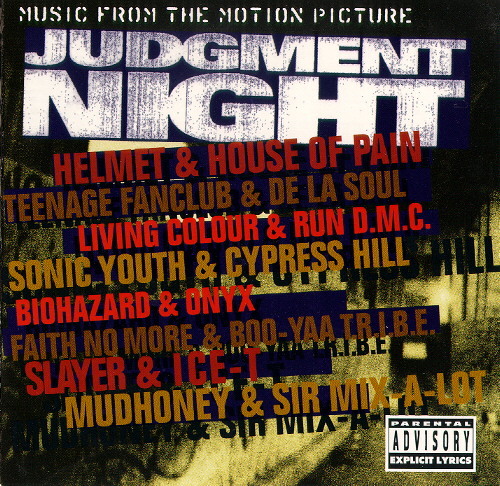 One great example is the rap-meets-rock mash-up that is the soundtrack to 1993’s Judgement Night, a pretty one-dimensional crime-thriller starring Emilio Estevez, Cuba Gooding Jr, and Denis Leary. The movie was relatively unremarkable but it’s soundtrack, which paired “alternative”-leaning rock + pop bands with rap groups, was pretty innovative and, nearly 22 years later, its songs leave much more of a legacy than the move itself. Unapologetically standing on the shoulders Aerosmith + Run DMC’s success with their collaboration on “Walk This Way” on Run DMC’s 1986 Raising Hell, the producers of Judgement Night tapped popular rap groups at the time (including Run DMC, for good measure) with hard rock and alternative pop-rock groups, including Sonic Youth (paired with Cypress Hill), Dinosaur Jr (paired with Del tha Funkee Homosapien) and Mudhoney (paired with rap royalty Sir Mix-A-Lot), among others. Most of the musical pairings were done pretty well, producing, if not a great stand-alone track, at least some interesting, innovative musical styles for the time…though the popularity of the soundtrack also largely birthed the almost universally terrible 90’s rap-rock genre to come. 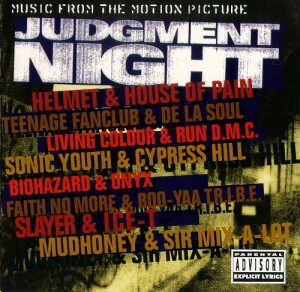 Regardless of the sonic, cultural damage the Judgement Day soundtrack may or may not have done in the long term, it also produced a few excellent tracks; chief among them—”Fallin'”, a catchy, light-hearted song that skillfully pairs New York City’s peace-preaching rap trio De La Soul + Scottish alternative shoegaze-pop band Teenage Fanclub. Following the strange intro, the song unfolds into a poppy, sparse, laid back soundscape punctuated by a sample from Tom Petty’s “Free Fallin'”—the song’s namesake. Over all of that, Posdnuos, Dave, and Maseo from De La Soul deftly spin a tale of the fall of a washed up rapper who can’t get past the thought that everything he does it like fallin’. Give it a listen below and remember, though it came at a heavy price in the form of bands like Papa Roach, Linkin Park, and (shudder) Kid Rock, it’s still a pretty stellar track.